للمسافرين الذين يرغبون أن يعيشو كل ما تقدمه كيرنز, كيرنز ساوث سايد إنترناشونال إن موتيل هو الخيار الأمثل. يقع مركز المدينة المثير على بعد 5 km فقط. إن سهولة الوصول من الفندق إلى المعالم السياحية الشهيرة الكثيرة في المدينة كمثل Cazaly's Stadium, DFO Cairns, Direct Factory Outlets, Cairns Golf Club هو استثنائي بحد ذاته. إن كيرنز ساوث سايد إنترناشونال إن موتيل حريص على توفير الراحة للنزلاء، فلا يوفر الموظفون جهداً في تقديم أفضل الخدمات وضمان حسن الاستقبال. إن واي فاي مجاني في جميع الغرف, خدمة التنظيف يوميًا, فاكس, آلة تصوير, خدمات بريدية هي جزء فقط من الخدمات التي تميز كيرنز ساوث سايد إنترناشونال إن موتيل عن باقي الفنادق في المدينة. تتضمن كل غرف النزلاء وسائل الراحة والتسلية المصممة خصيصاً لضمان الراحة القصوى للضيوف. كما أن مجموعة الخدمات الواسعة الموجودة في الفندق لضمان راحتك تترك لك الكثير من الخيارات لقضاء وقتك أثناء فترة إقامتك. إن كيرنز ساوث سايد إنترناشونال إن موتيل هو خيار ذكي بالنسبة للمسافرين إلى كيرنز، بما يوفره من إقامة هادئة ومرحة. I enjoyed the place. There is a mall about 1 km away. Liquor place is close as is Subway and pizza place. Shower is good, just an unusual setup. Staff are excellent. The lady (40+) was nice to give me an umbrella. The younger redhead (20) was nice, friendly and always helpful (wish I got her name). Could not get wi fi in my first room, but didnt need it. Nice big bed. Quiet. I think the only thing lacking was some additional security around the locks and cameras at the doors. I found the 1 end door unlocked 1 time. Pool is good for families, but could use a good cleaning. It is a 2.5 star in North America, same as a Super 8 or Motel 6. Easy to find. Convenient parking. Fast settling. Comfortable room, clean and comfortable. Swimming pool on site. Photos correspond. The price tag is adequate. Recommend. Stayed for one night in transit. Not much facilities nothing nearby no view in room not much expectation either. Cleanliness is passable with slight stain on bed. Bed was pretty comfortable. Room was spacious and clean. Bed was comfortable although slightly hard. 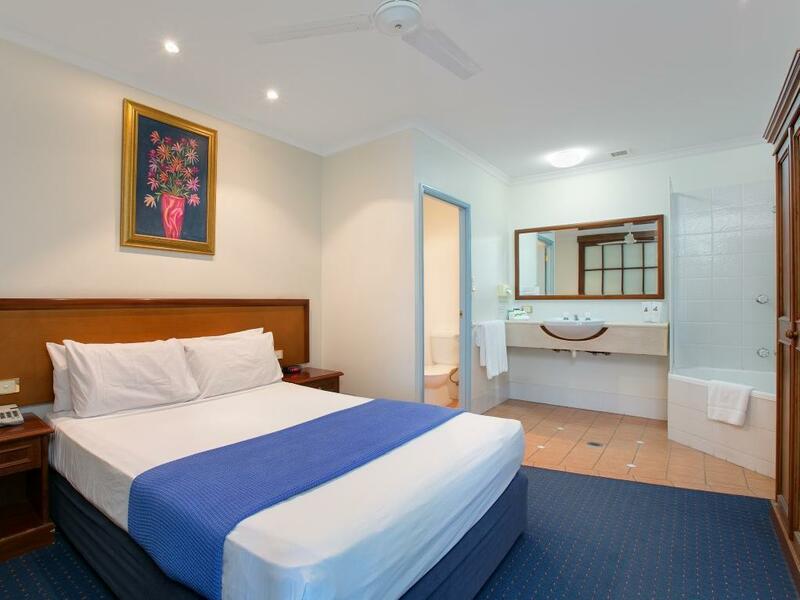 Driving distance to CBD good value for standard accommodation. Only negative was couldn’t find a car park out back when came back from markets at night. Would stay again when visiting Cairns. Room was clean, however a guest was smoking on our floor and the smell of cigarette was wafting through into the room. Shocking parking available & having the exit gate permentaly locked was very inconvenient as the small parking area was always full (with buses aswell) and it was very hard to maneuver the car to turn around and go out the same way we came in (which is one way) good budget accommodation great location on the main road and has a restaurant in the motel aswell. 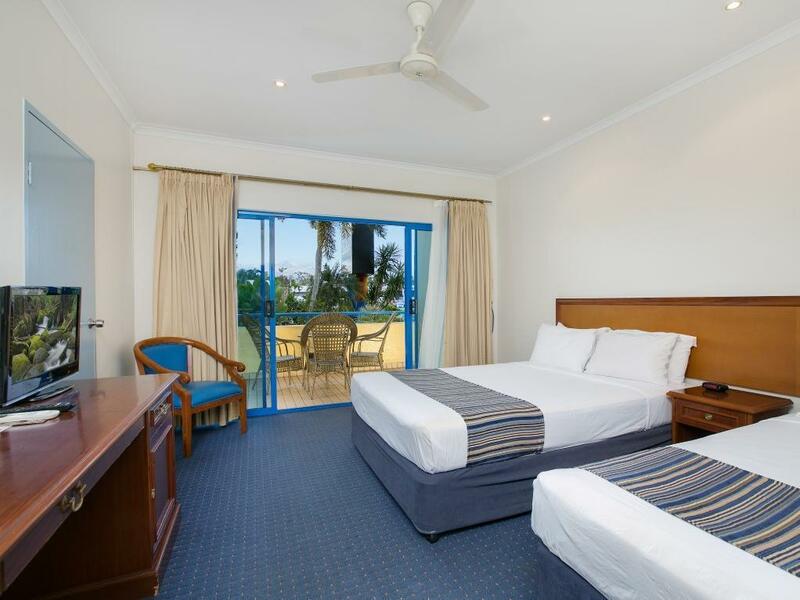 Staff were courteous and helpful, the rooms tidy and well cleaned daily. The chef at their restaurant really knows his business as the meals were very adequate and expertly prepared. There is plenty of car parking available and the large shopping center is a short walk from the hotel. The room was spacious staff very friendly and plenty of places to eat nearby. 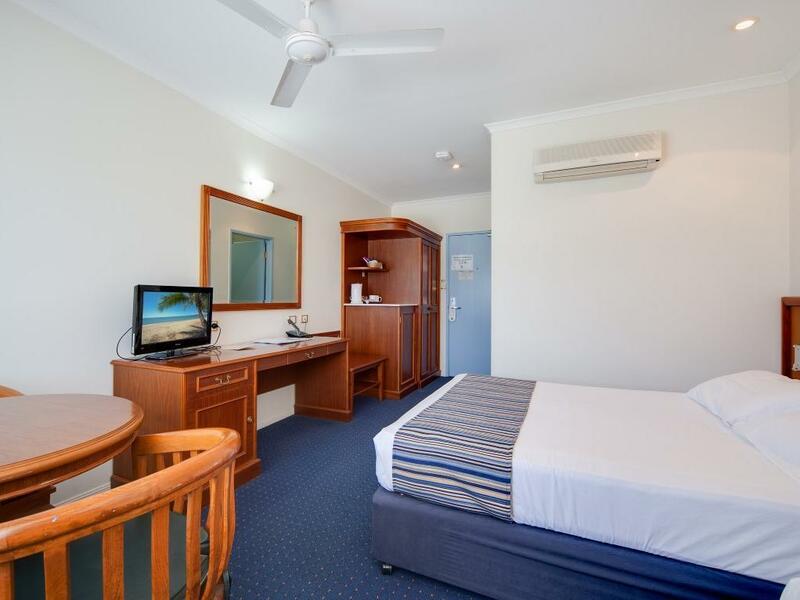 I stayed for one night while transiting Cairns overnight. 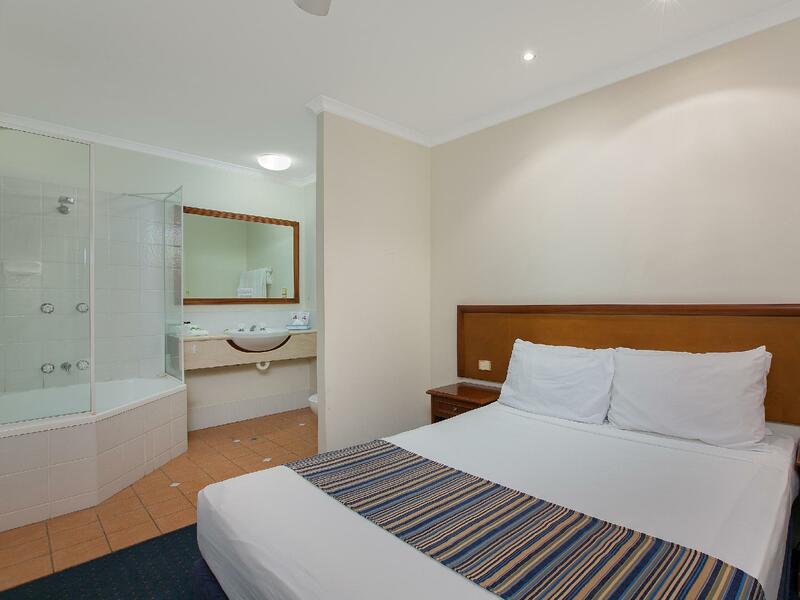 While it is not in the City this hotel has a lot of amenities in easy walking distance such including a large shopping center, convenience stores and a very nice football club with great food. It only took 15 minutes to drive to the airport and only five minutes into the city. I will definitely stay here again. it was ok far a one night stay but not for long duration. best thing is the location. my tv remote was missing but that's not a big deal but the boiling jug is very dirty!! needs a very good wash inside in jug or get a new one. My stay was nice and the room was clean and quiet. The staff were friendly . The only bad thing was there were stairs I had to climb to my room on the third floor due to no lifts. It was hard work taking a 20kg suitcase up the stairs. The Staff were excllent, The rooms were spotless, The Food was Great. 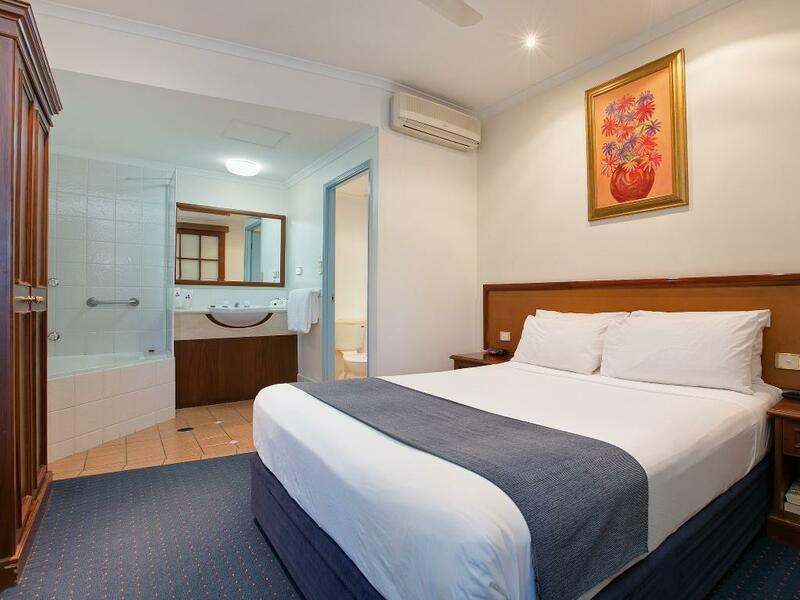 great, if your looking for a nice, clean and safe hotel less then 10 minutes from the city then the Cairns southside international is the place for you. The restaurant is really great with the chef happy to meet all your requirements, the eggs benedict are just one of his specialties that will not disappoint. We stayed 5 days and during that time our beds were only made up once. Towels were changed daily but cups and glasses not cleaned. Bench and sink not wiped down and tissue box was empty for 2 days. The road it is on is very busy and there are no take-aways or restaurants nearby....in fact nothing is nearby. 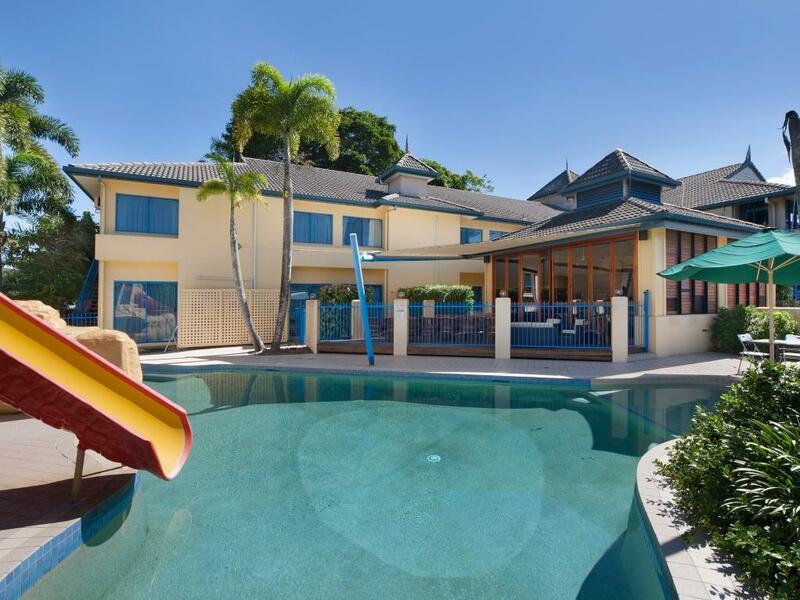 Best location: 100 m from reef fleet terminal, right at the end of Esplanade. Super location and very friendly staff and concierge. The only trouble we had was related to the breakfast. It was included in our rate, however the restaurant consistently was trying to charge it on us. When we complained about this at reception, they waived all charges. 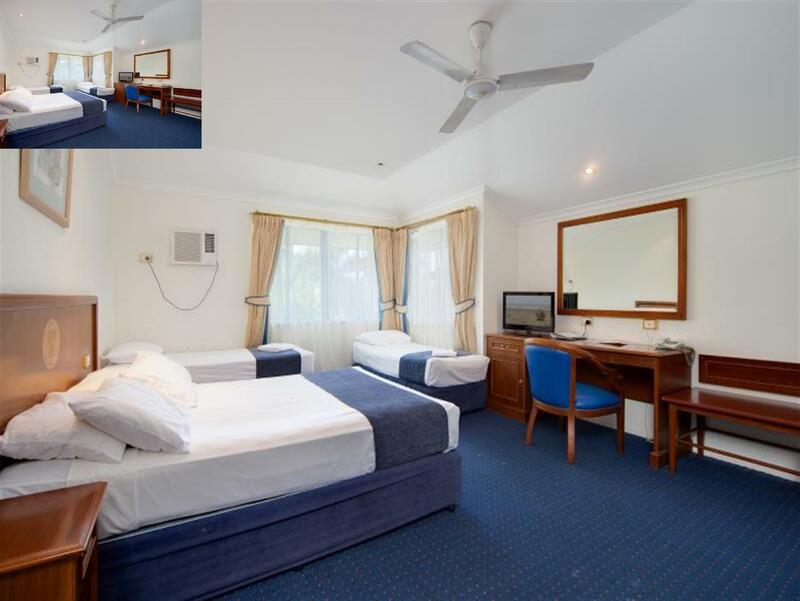 Very helpful staff, excellent restaurant, clean older type rooms with queen beds, bus stop out the front, offstreet car parking. 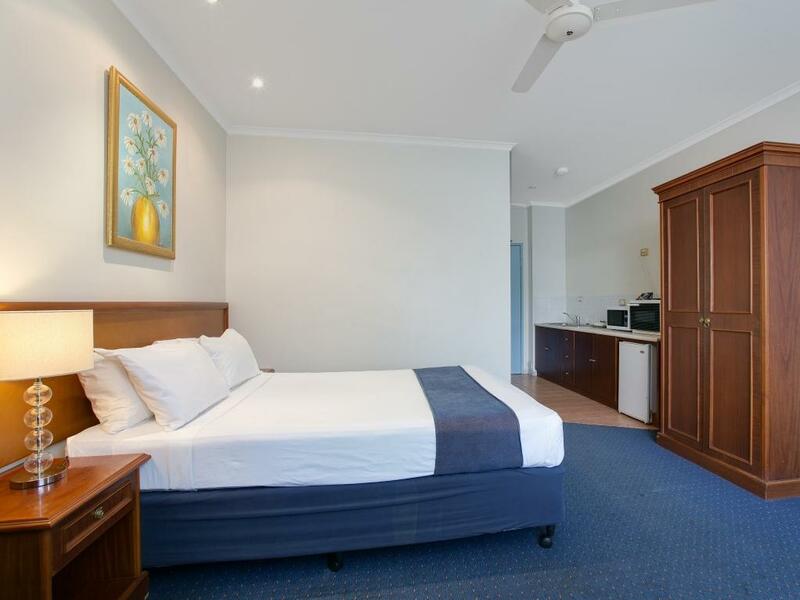 This is a great hotel/motel with terrific staff, great meals in the restaurant at a reasonable price, very relaxed atmosphere, good air con in the rooms with key card security, would recommend to all who do not need all the frills of the major hotels in the city centre. 4 star rating. Good option if you have a car, Rooms are quite satisfactory at a reasonable price.